The Vedanta Group has asked the Orissa government to restrict entry of foreign non-governmental organisations (NGOs) in the area where it proposes to mine bauxite, as part of its $8-billion project in the State, alleging that these NGOs were instigating the local population. “These NGOs comprising Survival International and Action Aid are instigating locals to go to the hilltop, where we have proposed to mine bauxite, and set up houses. “The Orissa government has already said that there is no tribal population in the proposed mining site. Such efforts by these NGOs are aimed at harming the project and investments in the State at large, their movement has to be regulated," Vedanta Aluminium chief operating officer Mukesh Kumar told PTI. Vedanta Aluminium, a subsidiary of Vedanta Resources, has already written to the State's home ministry seeking restrictions on movement of such foreign nationals, besides investigation into their source of funding, he said. When contacted, Survival International's spokesperson said, "Survival International does not oppose industrial development. But where, as in this case, industrial projects take place on the land of indigenous people, they have a right to be consulted at the very least. Vedanta has not bothered to do this." On the contrary, the NGO said, the metal company has "launched an unprecedented attack on Survival International, apparently to drive its researchers out of an area where the company is planning to mine." However, Mr Kumar added, "They (the foreign NGOs) are the enemy of industrial development in the State. If such NGOs and foreign nationals have come on tourist visas, why are they camping in jungles of Kalahandi and Rayagada? They should go to places like Puri. If they do not abide by the rules, they should be sent back," he added. Mr Kumar said that the influx of foreigners has gained momentum after environment minister Jairam Ramesh instituted a probe into the allegations of illegal bauxite mining by the firm which is in a joint venture with Orissa Mining Corporation at Niyamgiri. When contacted, Action Aid Orissa head Dhandari Jaina said, "We are working for the cause of the most marginalised population. Everyone knows what we do and what we are doing." Vedanta has got an ‘in-principle’ approval from the State government to start mining at the proposed site. It is awaiting clearance from the Union environment ministry. 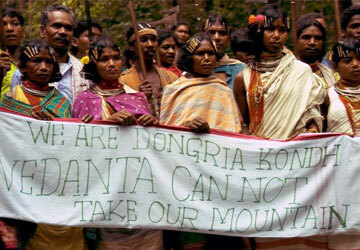 Orissa steel and mines minister Raghunath Mohanty had said that "not a single family of Dangaria Kandha tribe lived at the proposed mining area, located between Rayagada and Kalahandi districts" and there would be no displacement. But the proposed mining project has reportedly been facing protests from locals and foreign NGOs over allegation of tribal displacement, contrary to Mr Mohanty's assertion. The green bench of the Supreme Court had last year given its approval to the project. Vedanta Resources has planned an investment of $8 billion (around Rs37,000 crore) across the State in power and aluminium projects.